The red, blue, and white Swarovski 81785 BeCharmed Pavé Flag "France" is known as the "French Tricolour," and has a stainless inner part branded with the "Swarovski Crystals" logo as confirmation of its authenticity. Red and blue were recognized as the colors of Paris even before the French Revolution of 1789-1799, with the white of France's royal Bourbon dynasty added a few years later. These colors also constitute the flags of The Netherlands, Australia, and New Zealand. Created from myriad tiny pavé crystals, each handset to form a subtly sparkling finish, the Swarovski 81785 BeCharmed Pavé Flag "France" is a beautiful reminder of home, or a thoughtful gift. 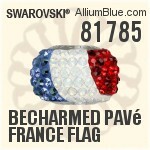 Swarovski 81785 BeCharmed Pavé France Flag consist of lead-free ADVANCED CRYSTAL by Swarovski.